To obtain a position in the field of GIS Technology and begin a new and exciting career as well as further my knowledge and experience in this growing technological field. 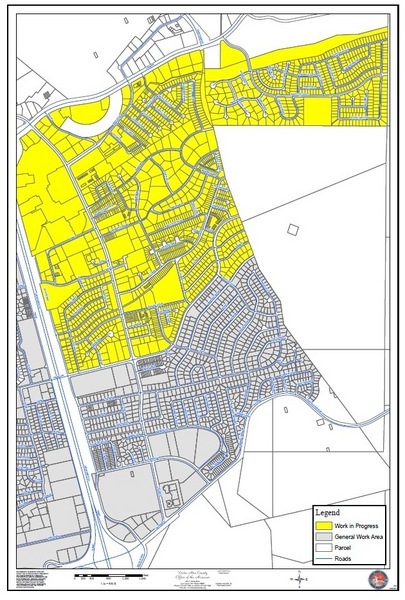 Perform detailed technical GIS functions related to the Dona Ana County Assessors Office Mapping Department. Review, prepare, create and update parcel assessment data based off of detailed survey and deed / title documentation. Generate and produce standard and customized digital maps. Plot and catalog incoming parcel deed splits and combines for current and next year property tax roll. Data entry into GIS (SDE Enviroment) database in order to maintain accurate parcel assessment data. COGO approved subdivisions and plat maps approved and stamped by Professional Land Surveyors in Dona Ana County and surrounding areas. Research previous deed / title and plat / survey evidence, archived maps and drawings related to all projects. Provide customer service to co-workers and the general public with regards to GIS mapping requests and issues. Utilize digital Aerial Photos for mapping functions related to all projects. Upload data on FTP website for outside organizations to access data. Scan new and achieved maps in order to catalog and preserve data. Perform all work duties utilizing ArcView 9.3 with ArcINFO License. Perform detailed field utility surveys to develop a data management system for all new utility installations including existing buried utilities. Maintain & Update (As-Built Drawings) for mine utilities project utilizing AutoCAD software. Locate buried utilities and field mark for excavation purposes with field locating equipment. Research previous survey evidence, maps, drawings and physical evidence as well as all records related to projects. Develop, update and manage information in a GIS database. Update mapping data utilizing AutoCAD software and ESRI software. Train and assist new hires in all areas and aspects of the Blue Stake procedures and policy for NM operations. Work under minor supervision and oversee addressing for statewide Grant County 911 projects. E-911 addressing for emergency response purposes. Maintain Road Centerline and structure point shape files for GIS database. Create readdressing projects and analyze data to improve 911 response times. Update and Maintain (MSAG) master street addressing guide for incorrect addresses. Create and produce maps for dispatchers, law enforcements and School Districts. Develop, create, and present projects to local government entities. Communicate on constant basis with parties involved such as City and County government, Qwest, Intrado 911 database team, USPS, SDR contractors. Locate, gather and value real and personal property. Locate property by legal description, metes and bounds or lot and block using U.S. Forest Service maps and cadastral assessment maps. Experience in computer database management using Microsoft Word, Excel, and Power Point. Data entry on deed and title transfers. Ability to research and identify deed, title and survey documentation. Field visitations speaking to individuals in order to keep up to date assessment records. Effective communication skills with public relations. Clerical duties and experience with office equipment. Maintain all highways and major roadways for the safety of the traveling public. Operate heavy equipment such as five and ten yard dump trucks, loaders, sweepers and 4 x 4 vehicles including snow plows. Maintain important documents such as payroll, fuel charts, stockpile maintenance and specialized reports. Work in various weather conditions such as heat, rain and snow. Currently enrolled in Geography program at NMSU.